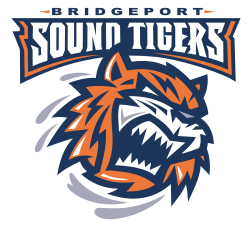 Bridgeport Sound Tigers. Image from Wikipedia. The Bridgeport Sound Tigers are slumping big time as they have dropped their last six games, the last win dating back to November 18. It seems so long ago…let’s recap. Bridgeport, coming off of a two-game win streak against the Manchester Monarchs and Providence Bruins, returned to the ice on Wednesday, November 21 against the Adirondack Phantoms. Unfortunately, the win streak ended with a 5-1 loss against the masked villains. The Phantoms played a solid game with a lot of scoring opportunities and big hits. They gained and sustained the momentum in the second period as they scored two goals before Jon Landry put one in the net for the Sound Tigers. The Phantoms sank two more goals before frustration mounted and fights broke out. One more score by the Phantoms solidified a 5-1 win. The Sound Tigers continued to struggle on the ice against the Connecticut Whale. On Friday, November 23, Bridgeport and Connecticut faced off for the third time this year. It was a high scoring game and the Whale skated away with a 7-5 victory. The Whale jumped out to an early 2-0 lead with Kreider and Grant finding the back of the net in the first period. The Sound Tigers awakened in the second period with three unanswered goals, two of which came from the UPS line (Ullstrom, Persson, Sundstrom) and the other from Sean Backman who gained the puck and split the defense to put his team in the lead. Then Whale’s Kris Newbury scored a goal to tie the score 3-3. The third period was a defensive disaster for both teams. The UPS line scored the next two goals to put the Sound Tigers up 5-3, but the Whale went on their own run with four unanswered goals to end the game. Things seemed to get worse for Bridgeport the following night against the Binghamton Senators. The Sound Tigers were outshot and outhustled from the start. Cole Schneider and Eric Gryba each scored twice for the Senators while Derek Grant and Andre Benoit accompanied them in the goal column. Brandon Defazio broke up the shutout with six minutes left to make the score a less embarrassing 6-1. On Friday, November 30, the Sound Tigers dropped a game 2-5 to the Hershey Bears. Both teams struggled to put the puck in goal until the second period. A goal by Sundstrom gave Bridgeport the lead, but it was short-lived as Hershey scored before the end of the second. Hershey went up a goal in the third, but defenseman Jordan Hill evened the score for Bridgeport seconds later. Hershey scored three more goals before the end of the game, one being an open netter. The Sound Tigers looked more like themselves on Saturday, December 1 against Worcester even though they fell to the Sharks 4-3 in a shootout. Goals by Landry, Niedereitter, and Nelson helped land the Sound Tigers in overtime where neither team was able to claim victory. Two Sharks found the back of the net in the shootout, but Niedereitter, Sundstrom, Nelson, and McDonald were denied by Worcester’s goalie. On Sunday, December 2, the Sound Tigers again struggled offensively as they fell to the Norfolk Admirals 4-1. The Admirals took a 3-0 lead before Brock Nelson put the Sound Tigers on the board with a hard shot in front of the net. The Admirals scored once more on a power play before the end of the game. The Sound Tigers need to clean up their play. They are one of the most penalized teams in the league and yet they were recently ranked 23rd in the league in their penalty kill. McIver is leading the league in minor penalties (19 and 78 penalty minutes) while Brett Gallant is leading in penalty minutes. The Sound Tigers are giving teams too many easy opportunities and preventing themselves from getting into any offensive rhythm. The key for the Sound Tigers is sustainability. If they get back to playing the unstoppable aggressive offense they showed before the slump, they are undoubtedly one of the top teams in the league. However, if they continue to get unwarranted penalties (and don’t improve their penalty kill), they’re going to continue to struggle. The Sound Tigers are currently second place in the Northeast Division, trailing the Springfield Falcons by seven points. They are ninth place in the Eastern Conference, only one game out of eighth. The Sound Tigers have a good opportunity to get a win against the Connecticut Whale on Wednesday, December 5. In a two week slump where the Sound Tigers are struggling to find the back of the net, Sundstrom continues to play aggressively and score goals for his team. He recorded one goal against the Hershey Bears and two goals and one assist against the Connecticut Whale. Although it hasn’t been enough to help the Sound Tigers win lately, his offense will be essential for the team down the road. Sundstrom is one of the top producers for the Sound Tigers with six goals and six assists. Back from an injury that sidelined him for several games, Casey Cizikas has been trying to contribute some offense for the Sound Tigers. He had a huge face off win in the first period against the Sharks leading to a Jon Landry goal. He also assisted Blair Riley’s goal against the Hershey Bears. With four goals and five assists on the season (while missing a number of games in November), Cizikas knows how to score and put his teammates in good positions to score as well. His return is a huge plus for Bridgeport. UPS delivery. Image from Wikipedia. unbelievable hockey against the Connecticut Whale. This line contributed four goals in what was the most impressive line play of the season. Ullstrom, Persson, and Sundstrom’s aggressive play was unmatched by Talbot who was clearly struggling to stop them from finding the back of the net. Ullstrom scored the first goal for his team. He then set up a scoring opportunity for his linemate when he skated down the right side of the ice and drew all of Talbot’s attention who was totally unaware of Persson wide open in front of the net. A swift pass led to a Persson goal and a tied game. Sundstrom scored early in the third period to give his team the lead. A few minutes later, an effort from all three players on the Swedish line added another goal for the Sound Tigers. Ullstrom’s aggressive surge and Persson’s follow up was stopped by Talbot, but Sundstrom found space over Talbot to go up two goals. Unfortunately, the Sound Tigers had no answer for the Whale’s next four goals, but the play of the UPS line was truly spectacular and something to keep an eye on during the remainder of the season. The Sound Tigers were embarrassed by the Binghamton Senators 6-1. Coming off two straight losses, they were hoping to pull themselves out of an offensive funk and get a win. Unfortunately, the Binghamton Senators had their foot on the gas and didn’t take it off the entire game. After allowing four goals, goalie Kevin Poulin was pulled in the second period and replaced by Anders Nilsson. Openly frustrated, he slammed his stick against the boards before exiting the ice. This moment represented the frustration of the entire Sound Tigers team as they continued to struggle both offensively and defensively. Poulin is 6-5 with a save percentage of 89.5%.